Hey Mercedes were an indie band from Milwaukee, Wisconsin, USA, that formed in 1999/2000 after the dissolution of Braid. The band consisted of Bob Nanna on guitar and vocals, Todd Bell on bass and vocals, Mark Dawursk on guitar and vocals and Damon Atkinson on drums. Hey Mercedes proved a more melodic antidote to Bob Nanna's previous band, Braid. With such hits as Stay Six, Our Weekend Starts on Wednesday, Let's Go Blue and Eleven to Your Seven, the band quickly gained popularity in an audience that had never been exposed to the scene. Hey Mercedes' first release was a Self Titled EP on Polyvinyl Records. Soon after its release, they signed to Vagrant Records and started touring for support of their upcoming Vagrant full length. In 2001 alone, they performed 114 shows. After the release of the band's first full length at the end of 2001, Dawursk left the band and was replaced with Mike Shumaker. With 2 full lengths, 3 EP's and 358 shows under their belt, Hey Mercedes called it quits. Their final show (#359) was at the Metro in Chicago on April 23rd of 2005. In a 2007 e-mail campaign, Threadless Tees reported that Hey Mercedes would play at the Metro, to celebrate the grand opening of the company's Chicago store. Spread Eagle, Wisconsin is a place best known for water, wilderness and paintings of the local ducks. Now it can take credit for LOSES CONTROL, the long-awaited second album from Hey Mercedes. As powerful as it is melodic, the follow-up to 2001's "Everynight Fire Works" finds the midwestern foursome's sharp, wounded songs crackling in a guitar-driven bonfire set by producers Sean Slade and Paul Q. Kolderie (Radiohead, Dinosaur Jr., Mighty Mighty Bosstones). From the instantly catchy anthem "Quality Revenge At Last" to the more insinuating closer "Go Drone," LOSES CONTROL is remarkably tight and accomplished for a sophomore effort -- though not without good reason. Prior to forming Hey Mercedes guitarist/vocalist Robert Nanna, bassist Todd Bell and drummer Damon Atkinson played together in Braid, a band often referred to as "emo pioneers," though you probably won't find the trio pleading guilty to either description. Nanna and Bell have been musical compadres since 1993, coming together at the University of Illinois as fans of Chicago punk bands like Naked Raygun and Screeching Weasel, while Atkinson joined them in 1997. 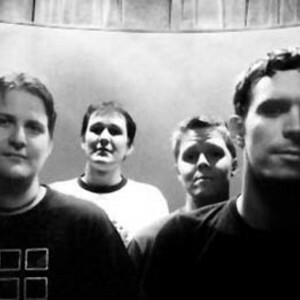 Braid broke up two years later with five studio albums and several hundred shows behind them, "but it was just so obvious that we needed to keep playing," Nanna says. The trick was to go down a different path, not just in terms of music, but logistics -- having done everything themselves for years and years, they wanted to stay connected to that grass roots ethic while cutting down on both genuine despair and "Spinal Tap"-like moments. "It's hard to focus on writing honest music when you're 3000 dollars in debt or have three more shows to book, or the show just got cancelled 'cause the cops came," Nanna says. This time, there'd be a record label and a more patient approach. Joined by guitarist Mark Dawursk, Hey Mercedes played their first show in August of 2000, put out an EP on Polyvinyl and spent the next year touring and developing their sound. Vagrant released "Everynight Fire Works," produced and engineered by old friend J. Robbins (Jawbox, Burning Airlines), in April 2001. It earned rave reviews, including Audio Galaxy's Album of the Year and a Top 5 position on the CMJ chart. Along the way, the band racked up their usual 200-plus shows per annum, including the sold-out Vagrant America tour and bills with Jimmy Eat World, New End Original and Saves the Day. They also found the time to share themselves with fans on a regular basis via "Are You Wearing A Wire?" a collectively written "blog" that can be found on the band's web site. 2002 saw the release of "The Weekend EP," as well as a personnel change - Clevelander Michael Shumaker stepped in for Dawursk, adding an enthusiasm for AC/DC and an eagerness to merely play guitar after fronting his own band Sheilbound. LOSES CONTROL was recorded at Slade and Kolderie's studio in Cambridge, MA. The band went into the session's half-afraid the unfamiliar knob-twirlers would impose a different style, but the veteran duo made sure Hey Mercedes' particular quirks and uniqueness were always at the fore. They broke down every part of every song in pre-production, built an amazing set of drums for Damon and gave Robert and Michael access to some three dozen guitars. "Because they knew our songs so well they knew which guitars would sound good on different parts of every song," Nanna says. "The guitars are awesome, really layered -- they just sound big and fat. "I think overall LOSES CONTROL is just more of a rockin' record than Fire Works," he adds. "It's really loud and in your face. Though lyrically, it's pretty bleak and desolate." Nanna's vocals bridge the gap between those poles, whether he's locked into "Boy Destroyers"' riff-o-rama or bringing a melancholy overtone to the textured spaciness of "Absolute Zero Drive" (a song the band had earmarked as B-side until Slade and Kolderie convinced them otherwise). Another highlight is "Lashing Out," angry/catchy pop-punk that unexpectedly mutates into a sweet lyrical homage to Sam Cooke's "You Send Me" - a couplet Bob sang while the song was being written, then couldn't bring himself to drop. And what of Spread Eagle? The band - three-quarters of whom currently reside in Atkinson's hometown of Milwaukee, with Nanna two hours away in suburban Chicago -- wrote much of LOSES CONTROL at a friend's home there, just a few miles from Michigan's Upper Peninsula. "It was probably a drunk moment," Nanna says. "We were like, 'y'know, what we should do is find someone with a cabin or a trailer someplace far away in the woods, where we can be as loud as we want for as long as we want, in total seclusion." So they dragged all their gear and a little bit of soundproofing up to Spread Eagle for two weeks of playing, writing, cooking and canoeing. "And we didn't go crazy," he marvels. "It wasn't like 'The Shining.'" Except maybe for this: Whether you're talking King or Kubrick, "The Shining" stands the test of time. LOSES CONTROL is a dynamite rock'n'roll record that's bound to do the same.